Specificity This antibody reacts to ERK/MAPK (pThr202 / pTyr204). 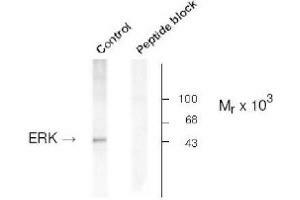 Antibody detects only phosphorylated protein and does not detect non-phosphorylated protein as shown by the lack of ability of a non-phospho peptide to block the antibody activity. Immunogen Synthetic phosphopeptide corresponding to amino acids residues surrounding the phospho-Thr202 and Tyr204 of ERK/MAPK. Application Notes Western Blot: 1: 1000 dilution to provide for 10 miniblots. Dot Blot: 1: 1000 dilution to provide for 10 miniblots. Storage Comment Ship on gel ice. Store (in aliquots) at -20 °C to -70 °C.